To each there own. I did favor part 2, 3 and 6 the best honestly. 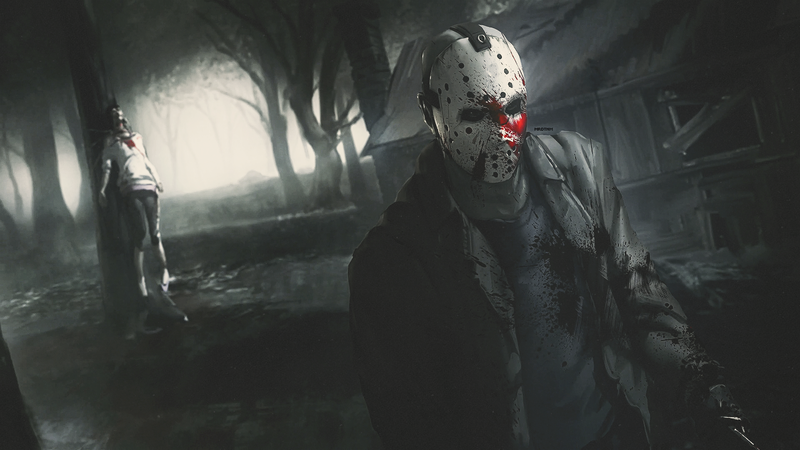 Simply cuz one, I love playing part 3 Jason and two, I also really enjoyed the characters in all of them. I love seeing the PACKANACK house and Higgins Haven. I swear they made this game sooooo close to the movies with how things are placed and how realistic the houses look. But I did enjoy Tina since she had all the mind power. She made Jason look weak but like I said, to each their own. I just kinda got into the whole Friday series from my boyfriend who is a HUGE AVID Friday fan and has a collection you’d have to see to believe *some made by savini himself and signed* as well as actual artifacts from the movies he paid thiusands of dollars for *with certificates of course* but he also favors part 6 and 7 the best out of all of them, as well as part 2. Honestly, I REALLY wish they would make Tina a special playable counselor. Like a Tommy Jarvis, she should have the one power to also defeat Jason. She was so badass in part 7 and she would be the secret weapon and should be the only counselor able to defeat Jason besides Tommy. But I know the devs would never make her a playable character in the game. She’d be too OP for gameplay, even against Jason, using her mind as a weapon. Not a bad idea tho to have her come back as a backup to Tommy for another way to kill Jason or survive the match. I’d say 5/10 games I’ll run into a lobby of people joining together and teaming up. It used to be bad before the patch but now it’s kinda scarce and seems they disappear or find no meaning in helping. But I do still run into my fair share of lobbies full of friends. That’s why i pay attention who joins and how many people join at the same time knowing they are all in a party. If I see that, I just leave. But if I join a full lobby and not knowing who joined together, I’ll scope it out and if I feel Jason spawns ON TOP of me, then i now for sure someone is hiding under a bed, scoping the map and telling him where everyone is. It’s pathetic! But me and my boyfriend have killed a many cheating Jason’s even with their friends beside them. There’s no stopping us! I’ve been guilty of calling out Jason’s being trash BUT under certain circumstances. My definition of trash is ones that literally GRAB GRAB GRAB and have no skill in hacking or trying to put up a fight. It’s just super annoying playing an ENTIRE 20 minute match with a grabber that just won’t stop being annoying. Those kinds of Jason’s win the *easy* way. It takes no skill to L2 all the time. At least hacking your trying to give counselors a fight and a challenge instead of finishing a match just by grabbing. And Jason’s who cheat and have friends who help are the trashiest!! I’m a pretty skilled Jason. If I know there are more than one counselor around, I will never grab knowing they will knock me down and rescue the counselor. I’m mainly a hacker and if I run them out of health and trying to spray themselves, then I’ll go in for the grab in hopes they don’t have a pocket knife or I’ll get them down to using their spray lots of times and I’ll keep hacking until they use what they have and then go for the kill by hacking more or grabbing cuz either way, if they have a pocket knife then they will be hobbling the entire time for a good kill. If possible, could they make it to where I can also be a counselor in the offline bot mode? I’d like to test my fix it skills as well as getting help from fellow bot counselors for escaping and/or killing a hard level Jason. Practice makes perfect! I’d love to be able to choose between playing a counselor or Jason offline mode. ORRRR I’d like to run while equipped but in order for that to happen, I’d like to have a second to pick up my weapon after being grabbed and rescued. Without having to go look at wasted empty cabins for weapons, that gives Jason more of an advantage to grab either me or my partner. I’d like to be prepared and able to run after rescue to hide away. It seems easy to navigate and not too big but challenging. I’d love to see a change in the map choices in quick play! I’m new to this and don’t know how to put more than one quote in. I don’t get on here often and quoting each one in one reply is a lot and having to delete all and go through ALL of it to put certain paragraphs in. My attention span is horrible and my patience is horrendous. So just bear with me. And no I’m not stupid or acting annoying or anything. I’m simply putting in my opinion as everyone else is and hoping for good results. Jason only resetting traps that were disarmed with pocket knives is a good idea. The ones that are stepped in can’t be reset yet a counselor can’t spray themselves. It’s more of a decision challenge and figuring out what’s better, disarming and having him reset it again or stepping in it and losing health and not healing yourself. In my eyes, they are good ideas. But everyone has an opinion so we can agree to disagree with each other.